highly-regarded LSC series, shortcomings of previous editions have been improved upon — from the mastering, to the LP pressing, to the sharp-looking glossy heavyweight Stoughton Printing tip-on jackets that faithfully duplicate the original artwork, "Living Stereo" logo, "Shaded Dog" label and all! Mastered by Ryan K. Smith at Sterling Sound from the original 2-track master tape, cut at 33 1/3, and plated and pressed at Quality Record Pressings — makers of the world's finest-sounding vinyl LPs, — no other editions match these for the quietest 200-gram platters available. One of the undisputed finest recordings in the history of classical music! Recorded at Kingsway Hall and engineered by Kenneth Wilkinson, this record couples Moussorgsky's Pictures At An Exhibition with Night On Bare Mountain. It has long been considered among the greatest-sounding records ever made. 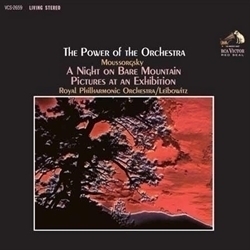 Perhaps most stunning about Power of the Orchestra are the effortless dynamics, which have been reviewed and raved about ever since the first RCA shaded dog. From the teeny, tiny, itsy, bitsy gentle plucks of strings to the WHAM!! CRASH!! SLAM!! of a full orchestra without a bit of notice. It's heart-stopping, jump-out-of-your-seat-type dynamics. The Power of the Orchestra — a more appropriate title there never was.